Car manufacturers are feeling the heat of slowdown. Rising fuel prices, hardening interest rates and higher cost of insurance have taken a toll on sales. The festival season has not yet lifted the market sentiment. Car-makers are now banking on Diwali sales to pick up pace. After a strong double-digit growth in the first quarter, passenger vehicle sales started to move south from July and the total monthly volume stayed negative till September. Dussehra sales were tepid for most automakers. Maruti Suzuki, India’s biggest car-maker, continued slow pace of sales in October, while Hyundai, the second largest, managed to sell 4.9 per cent more cars at 52,001 units last month. The two brands together command about 70 per cent of the total market share in the country. “Industry growth is under pressure due to an increase in total cost of ownership. This is owing to a sharp increase in fuel prices, higher outgo on account of insurance and uptick in interest rates,” Hetal Gandhi, director, at Crisil Research, said. She said the cost of ownership is estimated to have increased by 8-9 per cent in fiscal 2019 compared to an average 2-4 per cent increase in last five years. “We expect this festive season to show muted growth as compared to the last year,” Gandhi said. Maruti Suzuki clocked merely 0.6 per cent increase in sales at 135,948 units, up from 135,128 units it sold last year. 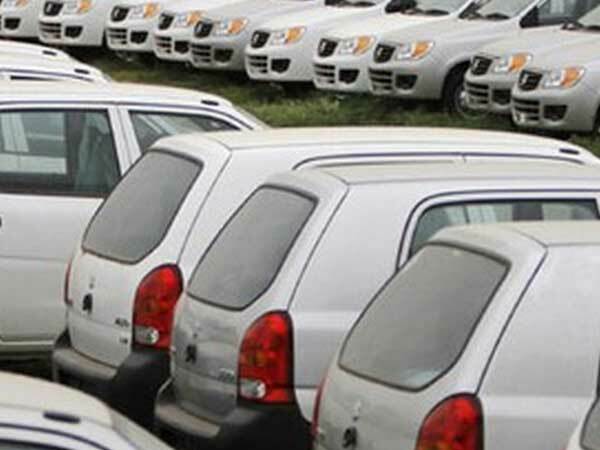 Sales at Maruti Suzuki in July fell 0.6 per cent to152,427 units, in August it dropped 3.5 per cent to 145,895 units and in September it increased merely 0.7 per cent at 151,512 units. For Hyundai “the strong demand pull was created by the blockbuster launch of the all new Santro car, improving customers sentiments and setting new benchmark in the industry,” Vikas Jain, national sales head at Hyundai Motor India, said. Sales at Mahindra, India’s second largest utility vehicle maker, rose only 3 per cent at 24,066 units, up from 23, 453 units it sold in the same month year ago. “For past few months, the automotive industry has been witnessing subdued retail sales for passenger vehicles segment, because of low consumer buying sentiment. Therefore, one has to remain cautious on how the festive season, ultimately, turns out to be,” Rajan Wadhera, president, automotive sector at M&M said. Sales at Tata Motors jumped 11 per cent to 18,290 units last month, up from 16,475 units it sold in October 2017. The brand’s sales were driven by the recently launched Tiago NRG, Nexon Kraz limited edition, the all-new Tigor and the JTP range of cars. “These cars have received an overwhelming response in the market,” the company said in a statement. Honda Cars India also continued slow sales, registering flat growth last month at 14,233 units. It sold 14,234 cars in the same month last year. “Despite the festival season, the consumer sentiment has remained subdued last month in comparison to the past,” Rajesh Goel, senior VP & director, sales and marketing at Honda Cars India, said. Toyota Kirloskar Motor managed to sell 2 per cent more cars at 12,606 units, up from 12,403 it sold last year. “We are happy that we have been able to sustain good demand despite the dampening effect on consumer sentiment owing to hike in fuel prices, higher interest rates and increase in insurance premium,” N Raja, deputy MD at Toyota Kirloskar Motor, said. Ford India also clocked 53 per cent rise in sales last month selling 9,044 cars, up from 4,218 units it sold in the same month last year. “The industry continues to face headwinds of low consumer sentiment, high fuel price and interest rate in the near term,” Anurag Mehrotra, president & MD at Ford India, said.